With free access to computers and the internet, public libraries and Schools’ Library Services are playing a huge role in supporting children and young people and their families to stay safe online, recognise fake news and develop critical literacy skills that will help them to be discerning users of the information they find online. 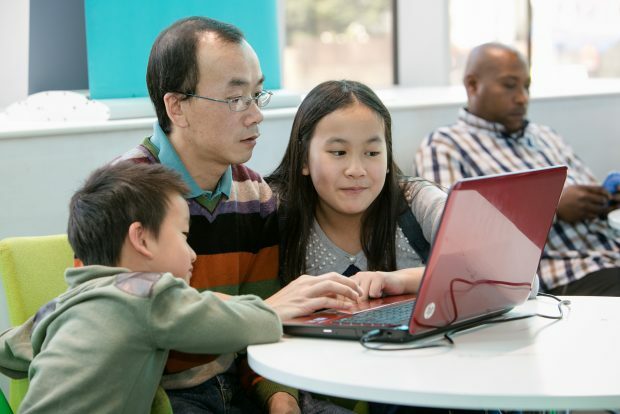 Hampshire Libraries deliver courses and workshops under their Learning in Libraries programme which support parents and carers in managing the many challenges they face when their children access the internet. Stoke-on-Trent Libraries have developed a series of e-safety themed sessions for different client groups and these include Looking After your Digital Footprint, Sharing Personal Information Online and Cyber Bullying. Library staff also deliver the CEOP (Child Exploitation Online Protection) Sessions in schools, to community groups and parents and carers. Islington Libraries are leading the way in the development of an e-safety policy for the Borough Council. Their policy is now used as a best practice template for all the other council services. SLS Guernsey staff sit on the island’s e-safety committee and support this work with a programme of internet safety lessons which include fake websites, digital literacy and citizenship. In 2015 North Ayrshire Libraries won the CILIP Libraries Change Lives Award for Appiness, a digital learning and e-safety programme for pre-schoolers and parents. The promotion of e-safety has continued with North Ayrshire Libraries Digidabble, a pop-up event providing a safe environment for families to learn together. Falkirk Libraries run AppyPlay sessions to help parents and carers use touchscreen technology to support their child’s learning. The sessions including changing settings to make devices safer for children and tips on choosing a good quality app. The Government is working to ensure that the UK is both the safest place to be online and the best place to start a digital business. After the publication of the Government’s Internet Safety Strategy Green Paper in October 2017 the DCMS has been consulting on the proposed initiatives and how the Government can work collaboratively with a wide range of stakeholders to tackle online harms and promote safer online communities. Representatives from the Libraries Taskforce, the Society of Chief Librarians (SCL) and the Association of Senior Children’s and Education Librarians (ASCEL) have been in discussion with DCMS about the role libraries play in integrating online safety into the programmes and services offered and it is good to see this recognised in the Government’s response to the Internet Safety Strategy Green Paper published May 2018. A full White Paper will be published later this year as a precursor to new online safety legislation. 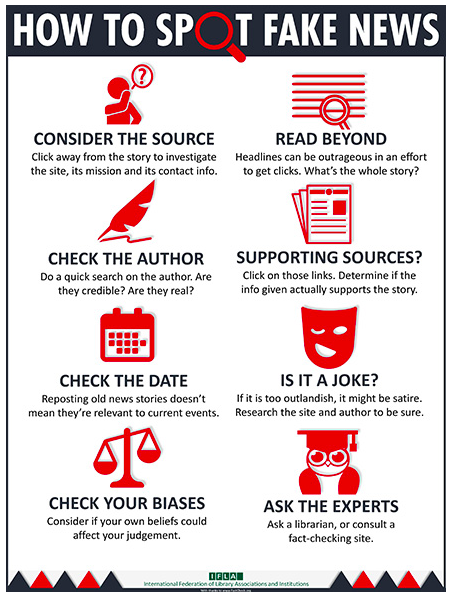 Recognising that this is an international challenge, IFLA (the International Federation of Library Associations) has created this infographic with eight simple steps (based on FactCheck.org’s 2016 article How to Spot Fake News) to discover the verifiability of a given news-piece in front of you. They encourage library staff to display it in their libraries, and everyone to download, print, translate, and share. ASCEL: the Association of Senior Children’s and Education Librarians are working with the NSPCC on a number of measures to support library services and Schools’ Library Services in keeping children, young people and families safe online. Teaching children and young people to be mindful of quality sources has long been a key feature in Information Literacy programmes delivered by School Librarians, Schools’ Library Services and public libraries through class visits to the library. ASCEL’s Children’s Promise recognises the importance of providing children and young people with the opportunity to engage with imaginative digital opportunities through libraries building their skills, knowledge and creativity. Tower Hamlets Schools’ Library Service Information Literacy Skills programmes focus on developing critical evaluative techniques, including the ability to do basic checks on trustworthiness and accuracy of information found on websites and helping young people to understand what is fact and what is opinion. Their programmes also look at search engines and help pupils to develop research skills that will ensure the retrieval of accurate information. 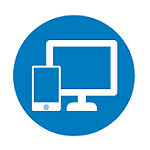 Information literacy programmes enable public libraries to introduce young people to the carefully curated collections of online resources they provide that support homework and other studies. On 13 September 2017 the All-Party Parliamentary Group on Literacy launched the Commission on Fake News and the Teaching of Critical Literacy Skills in Schools. This followed the publication of a report from the National Literacy Trust: Fake news and critical literacy evidence review. The report highlighted how children and young people in England do not have the critical literacy skills they need to identify fake news. ASCEL responded to the National Literacy Trust’s call for information to inform the commission and in mid-June 2018 the findings and recommendations from this work will be published. Now more than ever libraries and Schools’ Library Services need to be at the forefront of helping everyone to stay safe online and to navigate the wealth of information from online sources and social media.